As serious and responsible breeders, we feel that in order to be a "real" or reputable breeder, one must indeed have a breeding program, breeding goals, and breeding accomplishments. 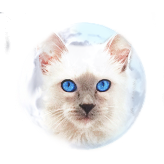 Though we do not believe that perfection is possible in any earthly manner, we feel that as breeders we must be the best stewards we can be, to improve, preserve and promote the Balinese cat breed. 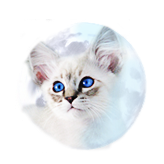 We consider ourselves stewards of the real Balinese cat breed in its lineage and standard. Our breeding program consists of much old and new age wisdom in regards to our breeding practices. 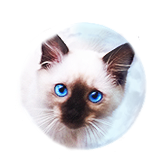 We believe in preserving old Balinese and Siamese cat lines for the sake of the breed, and its future preseverance. We as well believe in introducing new lines and rare colors, but keeping those lines pure in terms of the cat breed and standard. We aim to follow the breeding practices of Sylvia Holland in the preservation of the traditional colors, their Old-Style appearance, and Siamese/Balinese cat only breeding lines. We don't aim in changing these standards for anyone or any registry as we believe that the Old-Style Balinese cat should endure times and changes despite modernized standards, and change of mindsets. It took us quite a while to located and acquire our breeding lines from the best breeding programs around the country and abroad. Our breeding lines do not come from just one cattery or breeding program, as it would not be very healthy. Our kittens are a combination of old, new and rare lines only found here at Azureys cats. In present time, many Siamese and Balinese cat breeders around the world are having much difficulty in preserving rare and good breeding lines. This is due to cat associations, and the mentality of strict new age breeders focused in producing cats of modern standards, mixed lineages, and breeds. Some breeders have as well distributed their cats like merchandise all over the country, compacting many breeders' lines which is not healthy to the breed in the long run, due to the compact gene pool that it creates when breeders seek to find unrelated breeding lines to continue the longevity of the breed. For this reason, we caution everyone interested in acquiring a Balinese/Siamese kitten, that you do your research as a consumer, so to avoid backyard or irresponsible breeders, and cats that are not true to the breeds real quality and apperance. Just because a cat looks like a Siamese or Balinese cat, it does not make it one genetically or phenotypically speaking. Breeding is done for a reason, and it is done to preserve genetic lines that were introduced decades ago by nature, past breeders and fanciers who took upon the responsiblity of preserving those qualities, and genetics found in a creature. Without breeders, these animals would be lost to time and antiquity. We owe breeders the many animal breeds we presently have which include dogs, cats, horses, and livestock breeds which have many fundamental roles according to their breed standards. Rag-doll, Himalayan, and Oriental mixed cat breeds are not 100% related nor are they allowed to breed with actual Siamese or Balinese cats. Offspring from these cats are mixed breed cats, and are not purebred. Some of these "breeds" should not even be considered breeds as they were: (1) mixed in from other breeds, (2) are not directly related to the Siamese or Balinese, (3) and were not established naturally like the Siamese and Balinese cat breed. Though some breeders might aim to interbreed to provide new blood to their breeding lines, it is not ethical. If this were the case, there are plentiful foundation breed Siamese/Balinese cats all over the world to import/export and reintroduce new blood to existing breeding lines, but keeping the important qualities only found in the breed. Some color points in the Siamese/Balinese breed were introduced by minimal interbreeding, but they were produced decades ago with very strict rules so to concentrate the Siamese cat genetics, which is the only reason why they are now considered part of the breed. They include red points, torties, creams and Foreign-white Siamese cats that were only bred to/from Siamese only cat lines. These cats are also also considered a different classification on their own to distinguish those different colored lines. The breed name for Siamese/Balinese cats that are of other colors than that of the traditional color points are "color-point short-hairs", and "Javanese". For this reason, depending on which cattery a Balinese cat is registered with, a kitten/cat might be classified as a Balinese or Javanese cat. 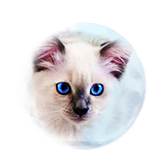 We and many Old-Style Balinese cat breeders hope to continue breeding and preserving this precious and wonderful cat breed for many generations to come. We know that with your help and awareness it could be made possible. 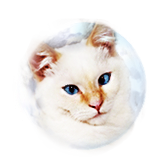 Thank you for your interest and support of the Old-Style Balinese cat breed.